In their recent update Apple made it known that they have officially rolled out the latest Operating System for their smartdevices. 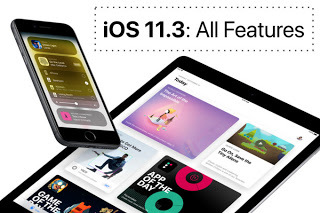 Apple has officially rolled out iOS 11.3 to all its devices including iPhone, iPod and iPad. The update came with lots of change-logs, features, bug fixes, improvements and many more. iOS 11.3 has already started rolling out to iPhone X down to iPhone 5s, 12.9-inch iPad Pro to iPad Mini 2, and iPod touch 6th generation. The OTA notification should pop-out on your phone. Below is the official change-log details as provided by Apple itself. Every change logs has a little note to explain it better. iOS 11.3 introduces new features including ARKit 1.5 with support for more immersive augmented reality experiences, iPhone Battery Health (Beta), new Animoji for iPhone X users, and more. This update also includes stability improvements ang bug fixes.